The Change-Makers of Highland Park. 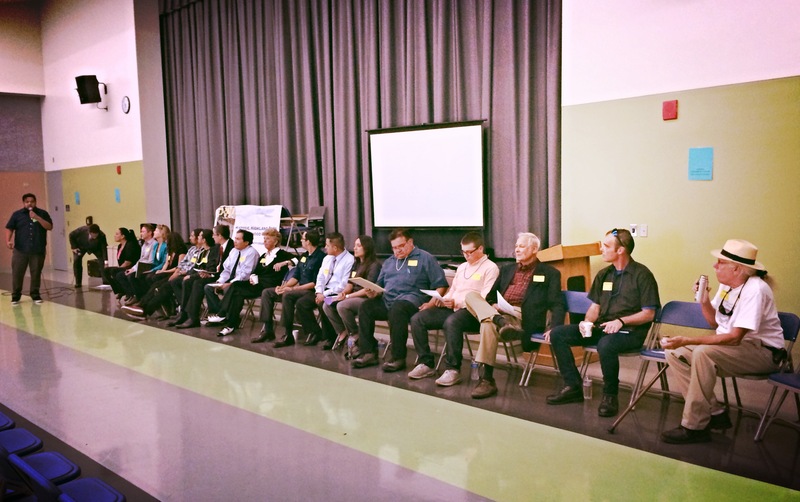 On Wednesday, April 16th, the 777-person capacity Tyler Auditorium at Luther Burbank Middle School hosted a two-hour Historic Highland Park Neighborhood Council candidate forum for 18 candidates and 15 audience members. Not quite the crowd as organizers had hoped for. Maybe it was because last week was Spring Break for most Highland Park residents, maybe it was $4 movie night at the Highland Theatre, or maybe voters didn’t see the dozen or so banners all around Highland Park telling them about tonight’s event. Whatever the case, what is important here is that Eighteen candidates showed-up to enlighten us on why we should vote for them, and four others who couldn’t attend, took the time to submit statements for the forum. Failed Nibble Bit Tabby brewer, Loyd Kattro who specializes in opposing the Highland Park Transit Village, and obsesses about seismic hazards while driving a beat-up 25-year-old Astro minivan. Edward L. Braun, who’s family dates back to 1896 in Highland Park. He wants to fight trash, graffiti, and make the roadways of HLP safer. Juan Pascacio, Real Estate agent, 5-year-resident, will use his real estate skills to do outreach. Margarito Martinez, an unstable homeless Chaplin is challenging the Monica Alcaraz presidency with allegations of gang conspiracies. Current member, Fernando Villa likes statistics, partnerships, and is the only candidate who wore a suit! 8-year-resident, Manuel Avila wants to make positive change in Highland Park. Canadian immigrant, 25-year Highland Park resident, Liz Amsden doesn’t like sanitation rates, doesn’t like bike lanes, believes in democracy. Candidates not present but who submitted statements are: Boo Caban, who wants to fight to get the same level of service more affluent neighborhoods get. (That’s what I’m talking about!) Javier Cabral, a journalist who recently moved to Highland Park wants to keep the neighborhood in balance. Amirah Noaman, program director for Eagle Rock Yacht Club has the distinction of being the only candidate from Highland Park (New Jersey)! She wants to use her skills in fundraising and organizing to help the council. HHPNC member, Johanna Sanchez is a lawyer who wants to continue to focus on land use and outreach for the council. No statement was submitted by Gabriel Lozano, David Andrés Kietzman, Mauro A Garcia, and Steve Crouch who was absent due to a concert he wanted to take his 92-year-old mother to. Not pictured is current HHPNC Treasurer, and future HHPNC Treasure Joan Potter, who is running unopposed. She demonstrated her economy prowess by not bothering to make a statement. Because, why bother? The empty auditorium inspired candidates to talk about how they would successfully outreach to Highland Park. Community events, consistency, promotions, networking, and partnerships were proposed in various forms as means to get people involved. The fact that so many candidates showed up to throw their hats into the ring is an encouraging sign. As the saying goes: Showing up is half the battle. Bring identification / documentation showing that you are a Resident, Homeowner, Property Owner, Business Owner, Horse Owner, etc. Details HERE. Voters must be at least age 16 to vote. See the Election Day tally here. All challenges from sore losers aside, swearing-in should happen in June. Congratulations and Best of Luck to all the winners! Anyne that knows the solution can you kkindly respond? What an idiot and a liar you are! My candidacy was built on EQUALITY LGBTQ SENIOR HOUSING AND A Q-HIGH for the One In Ten LAUSD Students who identify as LGBQT. It was based on Social Justice for DREAMERS, IMMIGRANTS, AND HOMELESS STAKEHOLDERS. And I would have brought FREE WI-FI to the 47% LAUSD Students who have the pads and tablets but no Internet connection. “Gang Conspiracies” were never brought up during the election. YOU OPPOSED ALL THOSE WHO WOULD HAVE BENEFITTED FROM A MARTINEZ PRESIDENCY! You weren’t hurting me. You hurt all of them!